But here’s the key: the way you deal with these struggles, plays a critical role in you eventually scoring 510+ on the MCAT, and eventually getting into med-school. So how do you deal with them? How do top scorers deal with them? The way a scientist would. Top MCAT scorers put on the perspective of a ‘scientist’ throughout MCAT prep. As a scientist, when you’re conducting experiments, you get many different results. Some are great, and others not so much. However, all of them are points of data – and every new data point, gets you one step closer to your goal. So when top scorers experience a setback during MCAT prep, when they get a practice or real exam score back that’s not what they expected, they don’t see it as ‘failure’ – they see it as another data point. We’ve been conditioned by society to view failures as definitions of our identity. When we don’t achieve what we set out to achieve, when we fail, we immediately give that experience the power to destroy our self worth. Which to a scientist and a top scorer, is pretty ridiculous. Just because you got a low score on an exam, doesn’t mean you’re not smart. Just because a scientist gets a negative result from a test, doesn’t mean he or she is going to consider themselves a horrible scientist. In fact, scientists are enthusiastic no matter what the result is, because with each result, they’ve moved one step closer to their answer by LEARNING something in the process. Your struggles during MCAT prep are teaching you something. No matter what they are. Your job is to identify the struggles, the weaknesses, learn the reason they’re difficult for you, and then immediately work on improving them. 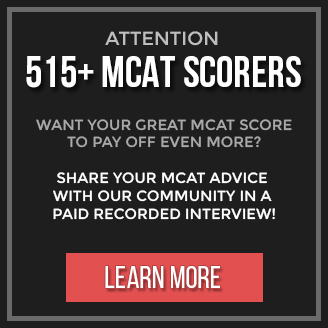 MCAT struggles and failures are the fees you’re paying to get to the score you want. That is the mindset of the 510+ scorer. Of course, you want to try your best to get it right as soon as possible - all scientists do! But no one seeks to fail and neither should you. Don’t fear failure and don’t let it negatively impact you. Remember, you are not your struggles and failures. You aren’t even your successes. Every result you get is simply an important piece of information that will guide you in your journey on a greater level. Enjoy the journey. Enjoy the game. When you lose your 'life' in a video game like Super Mario, you're excited to try again and beat that level because you know what you did wrong! Preparing for the MCAT isn't much different. Of course, the best and smartest scientists begin their experiments with a solid foundation. They gather all the research out there FIRST, before testing out any hypothesis. The last thing you’d want is to spend a huge amount of time, energy, and money, and end up realizing something that someone else had already figured out before you. Go through those FIRST or as soon as possible, so you can avoid as many unnecessary struggles and failures as you possibly can by learning from the mistakes and successes of dozens of other MCAT test takers who ended up scoring in the 90+ percentiles. Top scorers know that preparing for the MCAT in any other way is extremely inefficient. Especially since the MCAT isn’t like a normal undergrad exam. It's longer and covers more material than any other standardized test you've written. Which is why it requires a strategic approach to conquer. Instead of trying to figure out the strategic approach for yourself, or getting it from a source that isn't as good as a team of top scorers giving you MCAT strategy advice through a downloadable PDF that you can go through in an hour or two. Once you’ve implemented those strategies, you’ll completely minimize your failures and maximize your ability to achieve a competitive score that will move you forward on to the next big experiment of your life… med-school.